ROAD TOWN, Tortola, VI –The Leadership of the National Democratic Party (NDP), cannot be—at this point in time of its political juncture—in a position to effectively govern the Virgin Islands (VI) and place the interests of the people of the Territory as a priority. Opposition Leader, Honourable Andrew A. Fahie (R1) gave his views this past week during a press conference held Friday, November 16, 2018, at the studios of the Caribbean Broadcast Network (CBN) in Road Town, the Capital City, where he lambasted the NDP over its infighting and the spin-off effect on the country and its people. Hon Fahie was adamant, the VI is in dire need of strong leadership, given its existing political and other realities. Governor Augustus J.U. Jaspert, has already decreed that General Elections be held before April 16, 2019. Pay attention bossie they release themself already. Now get together with your new opposition and chose a leader. Looks like yourself has been demoted for the time being. Andrew, go take a seat and work on your candidate list. Who are your At Large Candidates? Now that Mitch is with Ronnie, who do you have for the 2nd district? This guy is so cunning with words. Infighting? I thought there were differences of opinion and values and if need be you separate amicably. What infighting? Just trying to scare the public for your own benefit. It will run its course no matter how hard you bawl for elections now. You may win, and then there’s a chance you don’t. Fahie is the same Fahie of yester year, Don't forget that, he has been out of the power seat a long time and he's now hungry for it. So all these hysterical rants will not work. Election will be called when its supposed to be and NOT because you called for it. Who is You?! all I have to say is the love of power goes alone with the love of money I lot of people feel like Fahie is the best person for the bvi I really don't think so,it's different when u have an boss and u being the boss. Hon. Fahie, they NDP bloggers like they want your head, look like they want to eat you over your statement. Don’t mind them you continue to address the ills of this territory. Even if this territory falls into a deep pit, some of them will still say things are good. Those who are talking about you can loose opposition leader pic, just don’t understand democracy. Although Ronnie, Archie and Mitch who left the NDP will be sitting on the opposition side of the house, Ronnie cannot be opposition leader, you will continue to hold your position and will have the guys working along with you to hold the government foot to the fire. 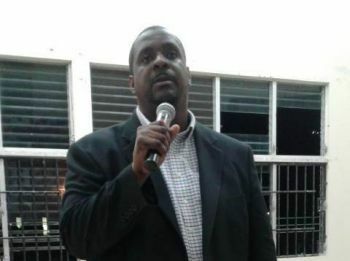 Fahie should stay out focus on his party and watch ndp perish in their own fire ..VIP is going to soon have their own in fighting when they choose 4 of the 8 at large candidates .If they think the rejected 4 and their fans will sit quietly. . Hmmm.